People are incredible, and incredibly complex. In our fast-moving, technology-centric world, we’re more “connected” than ever, but we don’t always connect. At The Myers-Briggs Company, our goal is to help people make those connections more meaningful and successful – at work, home, college, and everywhere in between. We provide world-class assessments, consulting services, training and a rich stream of content to guide you towards a better understanding of yourself and those around you. Our powerfully practical solutions are grounded in deep psychological and organizational experience, and decades of scientific research and development. And we’re ready to make your ideal real. Faced with complex people changes? We're here to make your ideal real. The Myers-Briggs Company is one of thousands of organizations around the world choosing to use business as a force for good. As a Certified B Corporation® we aim to make a positive impact in everything we do, and to meet the highest standards of social and environmental performance, transparency, and accountability. Yours, like any business, must continually transform to stay competitive. Yet, in today’s increasingly digital economy, you need to balance the adoption of new technologies with changing workforce behaviour and demographics. 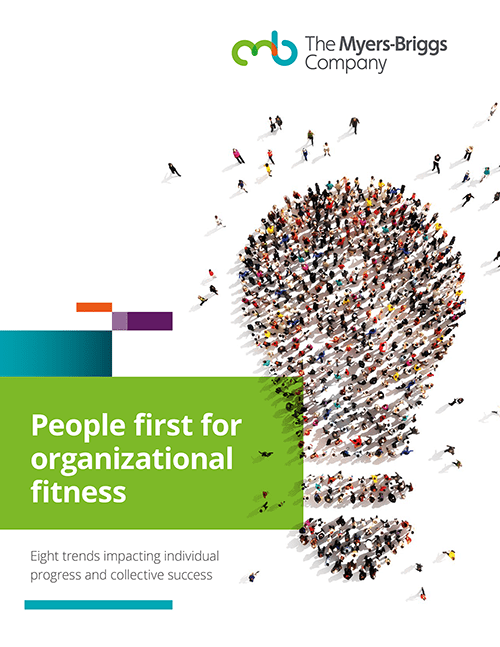 Organizational fitness depends on your people. Our latest report considers today’s most important people challenges. Informed by real-world business examples, research and expert psychological insights, we explain how a people-first approach will shape your future success. We will be in contact with you within 2 buisness days.